Winco J-5 Stainless Steel Jigger, 1 oz. x 2 oz. 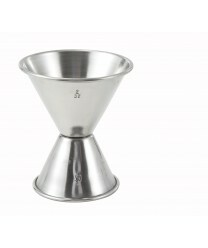 Take the guess-work out of bartending with the Winco J-5 Stainless Steel Jigger, 1 oz. x 2 oz. These two-sided stainless steel jiggers offer two different capacities. You can easily flip back and forth between the two sides, depending on your needs. The sides are clearly marked to prevent errors in measurement. How to use the map: Please refer to the key that details the number of transit days on the bottom right hand of the map. Refer to the color of the state that the item is being shipped to in order to determine estimated shipping times for this item. Please note that these shipping times are based on average UPS Ground shipping charts and do not include order processing time. Able Kitchen does not guarantee any shipping times and these charts should be relied upon for estimating purposes only. If you need your items to arrive faster, we offer expedited shipping methods during checkout (additional shipping fees apply). If you need your merchandise to arrive by a certain date, please speak to one of our customer service representatives to coordinate. Able Kitchen offers no shipping guarantees other than the standard guarantee covered under UPS. Lowest price guarantee: We'll beat any price online! Fast shipping - your order will be shipped immediately. Safe online shopping. Able Kitchen is an Authorize.net verified merchant.